In the early 19th century a voyage to India and the Far East took over a year to complete. Many hundreds of ships logs and paybooks survive and are stored in the British Library in large bound volumes. On the whole the logs/journals and ledgers/paybooks have not been copied or transcribed. Here for the first time a few have been made available to the general public. Day to day events are recorded such as cleaning, loading the ship, weather, floggings, recording of passing ships, sickness, disputes and death. These ships carried hundreds of crew and passengers and the logs list their names, rank and destinations. 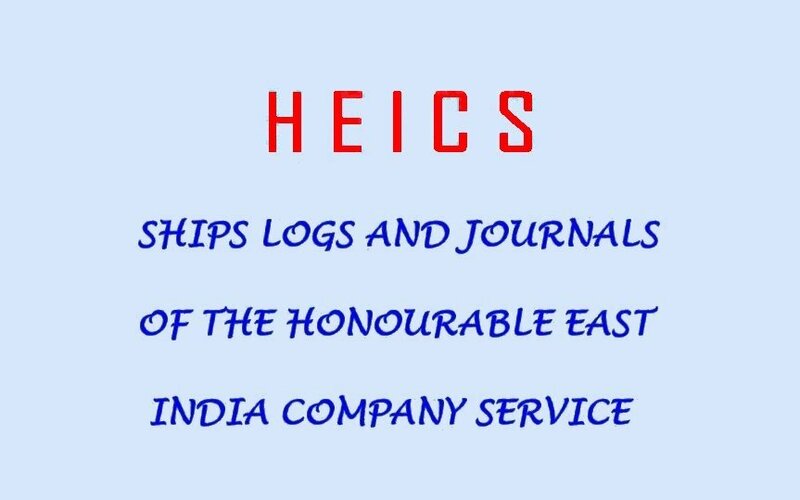 The records of The Honourable East India Company Service (HEICS) are now housed at the British Library in Euston, London. The Company was established in the year 1600 as a joint-stock association of English merchants who received, by a series of charters, exclusive rights to trade in the 'Indies'. The 'Indies' were defined as the lands lying between the Cape of Good Hope and the Straits of Magellen. Over the next two and a half centuries the Company grew to become the largest trading company the World has ever seen. In 1833 the monopoly of the East India had on trade with the Far East was broken. Trade was opened up to competition and within a couple of years the great ships that had ploughed the seas under the East India Company's flag were either scrapped or continued as private merchantmen, the Company finally folded in 1857. After the Company ceased trading and India House demolished, many tons of records were destroyed. Despite the destruction we are most fortunate that records covering the government of India, amounting to over 10 miles of shelves plus 70,000 volumes of official publications and 105,000 manuscripts and maps still survive. Amongst these records are many hundreds of ships logs, journals, ledgers and paybooks. The vast majority of them have not been copied and virtually non of them transcribed. This website is therefore a rare opportunity to access the contents of these magnificant tomes, with their windows into a world of everyday life on board a few of these ships.